Thanks for voting us into 2nd position in the gameplay mods-category, over at the modding awards 2016! This project started as a simple personal mod between friends in an attempt to keep the old battle balance from v0.x/v1.0-v1.05 since some of us didn't like the faster pace and the unit stat changes that were introduced in 1.1. I will also take requests (limitation based on time availability/scope of RPFM knowledge) if someone wants a version that is slightly different to the base one (ie. different TPY setting, activate civil wars or similar stuff). Only play it in "Normal" difficulty using this mod, anything else will have vanilla DeI values. "Normal" in DV has harder campaign AI than very hard. (The reason "Normal" was modified is because you can't set different difficulties for CAI and BAI in coop/head-to-head. This way you'll have normal battles and a hard CAI. Higher supply capacities in all regions. Several regions had their fertility rates replaced. AI now consumes slightly lower supplies in owned territory. Nomadic supply-stance was completely replaced by the barbarian one. No more starving steppe tribes. All characters, armies and soldiers now require exponentially more experience to level up. This will make your characters and soldiers more valuable once they reach veterancy. The higher rank, the slower to get to the next level. Agent caps increased, you can now have more agents than usual. Some baseline dignitary/spy skills have gotten small bonuses. All agent costs increased to balance out the new cap. All buildings now cost 50% more to build. Building upkeep has been removed from all buildings except for barracks, stables, workshops and military wharfs. A complete change to how the building template for public order works. No more farms, amphorae-makers and bazaars that give -12 public order. Now the city/town-cores give higher amounts of -public order, illustrating that higher populations are more unruly. You don't have to risk a riot just because you make a farm any more. All ships cost 50% more to build, but require 50% less upkeep. In a fleets case, the building of the fleet itself was the most expensive endeavour, while the marines fewer in numbers than land armies usually costed less in upkeep. Starting treasuries are set to 12000. Spend your gold wisely. Build that building, stack those levies or grease the palms of the neighbours you don't want to fight with right away. Lots of new emblems, banners and faction colours for various factions. Work in progress. Lots of new confederation options (example Pontus, Sinope and Trapezos can confederate into the Mithridatic Kingdom. Parthia, Khorasmii, Dahae and Parthava can confederate into the Arsacid Empire. Steppe nomads can confederate into The Scytho-Sarmatian Horde. Dacians and Thracians can confederate into the Daco-Thracian Kingdom. Several greek (non-successor) factions can confederate into The Greek City-States etc. All client-states have been removed. Satrapies have been renamed into Tributaries, and now all factions can create tributaries - allowing for a much more dynamic campaign map. Slightly more aggressive AI behaviour. Alliances etc now require higher relations. Trade is a little easier to get if you have access to resources. Pacts are turned off to stop the AI from spamming you with them mid to late game. Releasing prisoners is now actually useful if you want to increase your relations with a faction at war. Liberating a faction now nets 50% more green relations, should decrease the probability of the liberated faction declaring war on you (treacherous/devious personalities might still backstab you). Gifts now give more relations. The base for the combat-system is still the good ol' 0.x and 1.0 system but with several improvements and innovations. Now the weapon your unit uses has a lot bigger impact on their effectiveness in combat. 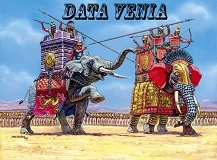 Swords give the highest bonuses against infantry, spears against cavalry, axes/maces grant AP to more quickly destroy heavily armoured units, slings have the longest range and most ammo, bows are better against armoured enemies, javelins are the best option against heavy armour and elephants. Ammo amounts have been increased globally. Flying Wedge charge bonus has been increased for more shocking charges. Tougher to run through pikes when they're deployed. Using a tweaked version of the 1.1 hoplite formation that works well with the AI, but slows your hoplites. Better bows/slings have further range. This means that elite archers will outrange basic ones. Romas got their gladius AP slightly increased. All cav now runs slightly faster than before. Ballistas, bolt-throwers and repeating bolt-throwers are now actually useful in inflicting casualties. Towers in sieges/fort-battles do slightly more damage. The ship towers can now burn enemy ships faster. Boiling oil has increased AoE and AP-damage. Slightly more and larger traps available. Larger groups of dogs per unit at higher expenses. 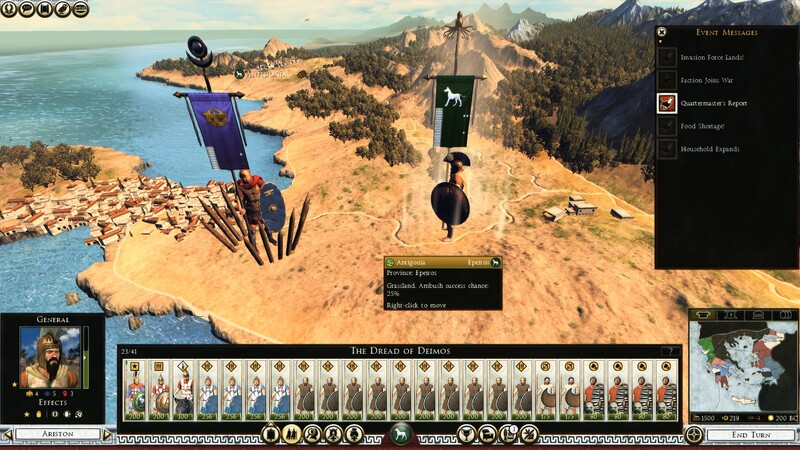 Increased morale and survivability of chariots to make them viable. Several units have gotten their sizes revised. Several mesh-changes to different units. 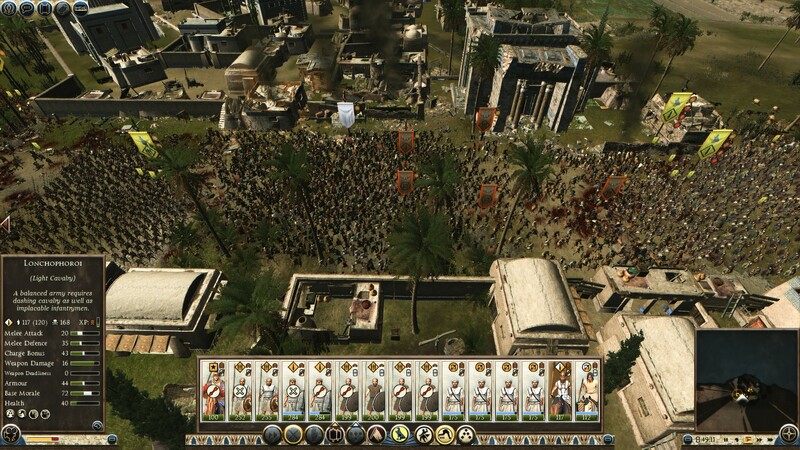 Ptolematoi keep their Egyptian religion with Hellenic influences, rather than the opposite system in vanilla DeI. All fog has been deactivated for two reasons - armies quite seldom fought in fog and now you can use Aztecs lightning mod with DV and avoid the unplayable fog it sometimes generates. Most general skills have had their durations increased, along with how many units they affect. Generals base "area-of-effect" range has also been increased. Range, ammo, damage/penetration, marksmanship and spread have been tweaked. Spread is higher now meaning that you will inflict more friendly fire if you simply shoot into large melee brawls. I recommend utilizing Flash's excellent "Concentrate Fire" ability if you want to avoid this. The best slings and bows got slightly better damage and accuracy. Slings got longest range, good against unarmoured targets and has most ammo (also good for countering normal archers/horse archers). The most elite slingers (Baelric/Rhodian) got some extra range. Bows (normal and mounted) are the best option against armoured targets. All artillery has been tweaked. Further ranges, changed ammo amounts and accuracy. Now scorpions and polybolos are actually viable to construct as they are more effective in terms of range and damage. Also onagers/ballistas has gotten a revamp for their "Fire"-ball shot giving them an explosive impact effect. I recommend using the fire option when you shoot at enemy units, while using the normal shots when firing on ships or walls. 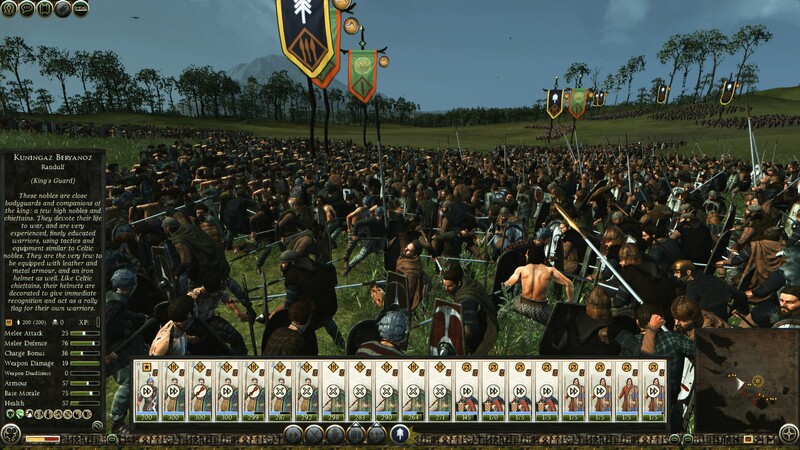 Added hoplite phalanx ability back to units fighting in that style and using those animations. It's a passive now and will inherently grant the unit a minor defense bonus just by being active on the battlefield (for those of us who missed the old toggleable formation). Pikes have been revamped, range has been boosted, weapon damage halved while formation is active. They will kill enemies if engaged frontally after a while (which they should) but not at a super fast pace. As usual recommending to flank them or shoot at them. Balancing pikes is tricky as you don't want them to be too strong or too weak. Slight tweaks to wedge formations. Added formations to units that were missing them (example: several melee cavalry units missing wedge). Units won't rout as quickly from rear/flank attacks now (this was a major issue when fighting on walls). Generals have had their aura-size increased. Generals will give passive bonuses to (mainly) morale and defensive/offensive stats, the more skilled general the higher bonuses to units in his vicinity. Losing your general will now hurt your troops morale more than before (AI has a lesser effect since they sometimes charge with their general first). Keep him safe if you can! Lots of minor morale tweaks in general. Most abilities now have a longer duration and will affect more units around them, the group versions even more improved (example: Since "Second Wind" has a longer duration now it will actually make a difference in comparison to the old super short duration). Several slings/bows were switched (example: all basic archers should now use the basic bow). HP on certain units tweaked (example: Elephants hp was increased). Units Armour has been tweaked (example: Catahpracts got slightly more armour now and naked barbarians got less) In general I've tried to keep the armour values as close as possible to how the unit actually looks. If they have cloth tunics and some animal hide shield then they shouldn't run around with 40 armour, same goes for nearly naked barbarians. Chariots have been buffed making them more viable to build. Dogs buffed a bit (still slightly weaker than old balance, use against light infantry, cavalry or ranged - they will die at a fast pace against heavy infantry). Revamped amount of traps available in sieges and their hp (wooden walls have a lot of HP now). Revamped siege engine hp (ladders will get burned fast now by fire arrows, I recommend building proper siege engines like a ram, siege tower or the "pyramid" thingy if you need to take an important city by storm and don't have access to ballistas). Boiling oil does more damage and has a slightly larger AoE. Going through that will hurt you properly now. Towers do slightly more damage and have slightly more increased range. Wooden towers have less hp and will burn faster. 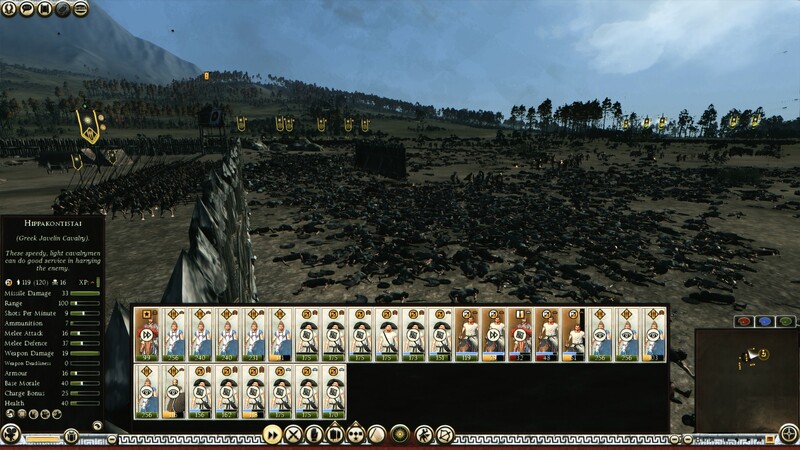 All cavalry now has 120 men per group. Stamina tweaks (Example: cav can run a little longer before getting tired). Reworked weapon bonuses against cavalry/elephants. Now weaker spears (basic spearmen, levy spearmen, garrison spearmen) won't be as strong against cavalry (but still get a bonus against them), while medium/elite spears/pikes will be the best counter. Javelins and pikes is the best way to deal with elephants. All garrison ranged units have gotten a rough 25% ammo increase, simulating the extra ammo available in settlements/cities. Garrison - changed some ranged units from javelins to slingers/archers for civilized factions. Barbarians will still sometimes have javelins in garrison. More distance between deployment zones to give enough time for formations, maneouvres, reaching preferred ground and intercepting reinforcements. "Normal" campaign difficulty harder than the default "Very Hard"
AI gets more money, more recruitment slots and won't be signing treaties with you as easily. AI wields more armies, perhaps you were used to them coming with 1-2 armies before - they might now come with 3-4 instead. Prepare your defenses! No more allying with half the world. AI won't be signing NA, military access or alliance treaties that easily with you even if they like you. Be on your guard! This means you can now play on "Normal" in coop or head-to-head and still be able to enjoy "Normal" battle balance with a harder than "Very Hard" campaign balance. Previously you needed a separate submod to be able to enjoy this. Both you and the AI have higher caps now. You can finally have governor-generals in several cities focusing on economic traits without tying your cap up on armies. Agent recruitment costs increased by a fair amount. Seasonal effects now have more impact since each month is two turns. You should think twice before starting wars in winters up north or in summer down south as the results might be devastating. Overhauled reforms, will now take more turns to reach. Deactivated since CA ruined the experience in their latest patch (optional pack available in "downloads" - adds back the default Civil War values from DeI, load before Data Venia). Slightly tougher to maintain public order when affected by raiding, culture differences, occupations etcetera. No more assassination spam, adoption spam or blackmail spam (hopefully). I felt this system was broken to begin with and due to it being hardcoded the only way (not including scripting) is to disable it. If the DeI team comes up with a nice solution in 1.2, I might reactivate it for the main submod (the normal civil war submod in "downloads" still has politics enabled). Giant public order minus from farms and the like didn't make much sense. I've decreased the -PO hit for several buildings meaning a stable province not experiencing wars, raids, cultural tensions, agent sabotage or extreme weather will be easier to maintain. Armies now move a bit slower than before. No more blitzkriegs and town-hopping. Plan your troop movements in advance, pay attention to seasons and supplies. Fleets still move a lot further than land-armies. 20% movement points for Romans, 33% for Greeks/Eastern and 50% for barbarians. 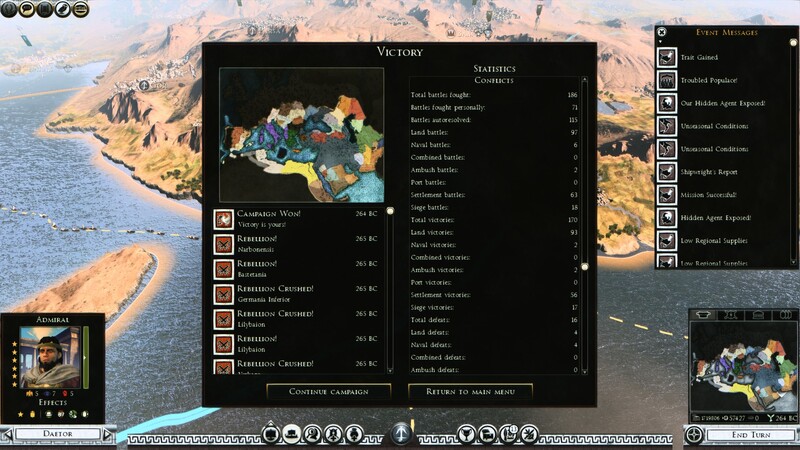 In overall the cost has been increased slightly since the AI has a difficult time beating a player in a fort, especially for barbarians who weren't known for producing many forts - while romans in comparison often ended up constructing a fort at the end of the day. Armies/garrisons now have a slighty further reinforcement range. You're not forced to hug your first army with your second one anymore to make sure both join the battle. Smaller "Zone of Control". You can now march past an enemy city without being blocked by a giant invisible force field. Troops/fleets now gain slightly larger bonuses from veterancy meaning your extremely battle hardened troops who survived dozens of battles should have a bit more badassery in them now. Veterancy for troops/fleets takes longer time to gain. Work hard for those badass veterans! Generals/admirals need slightly more experience to level up. You can now issue 99 edicts no matter what imperium level you are on, no more silly artificial limitations. Got 5 provinces? Issue 5 edicts! Some elite units moved up slightly to more advanced barracks/other buildings. More factions can now confederate. You now get less points at the beginning (first two levels or so) but more points later and more points in overall in comparison to default DeI - simulating that the more experience you get the more options you have for character progression. Possibly missed something as the amount of changes is large. When patching I will add patchnotes so people know what was changed. Adding guerilla deployment to a bunch of barbarian units (mainly germans, celts/gauls, iberians and britons) to make their gameplay feel more different from the rest. Krixux for his original noCW mod. DonKanaalje for his original reduced movement mod. PurpleKalmar for the original Legendary Commanders mod, Admiral Nelson for the navy tree. MobJarley, Noif1988, Dominus, Murvaidavid, Ep1c_fail and Leo_Africanus for their excellent emblems. IVYS4URUS for the custom banner art (works perfectly with 41-units per army). DeusEx010101 for his excellent custom coloured icons. The players who were PM:ing and asking me to release this to the public, without your interest I wouldn't have released the overhaul! *All army-banners now use IVYS4UR's custom banner-art. This means that you can play with 41-units per army if you want, without having to get any other mods. *Agent Actions Icons and Color list view Icons by DeuxEx010101 are now included in the mod. Easier to find your agents and look at attributes! *Updated to newest DeI patch (1.2.2). *The old levy pike unit is back! Only available for Antigonidai, Epirotes, Pontus and Seleukidai from the normal barracks. Other pike-factions already got their own native "levy"-variants. *Integrated "All Factions Playable" submod, you can now play nearly every faction! *Fixed issue with missing units from recruitment for several factions! *Fixed too low melee damage on certain new hellenic ranged units. Updated startpos.esf to correct one for all campaigns. Updated with correct supply system scripts. Had to re-upload the file with proper @-prefix (to make it load before DeI by default). You will have to re-subscribe on Steam due to the different file-name. Apologies! Some startpos.esf changes to starting unit-sizes (new campaign only). Updated general/admiral/agent experience threshold tables. 12 TPY version uploaded on request (non-steam link). Re-uploaded 12 TPY with default reform values from base DeI. Slightly tweaked amount of turns to reach reforms in the 24 TPY version (fewer turns needed than previously). 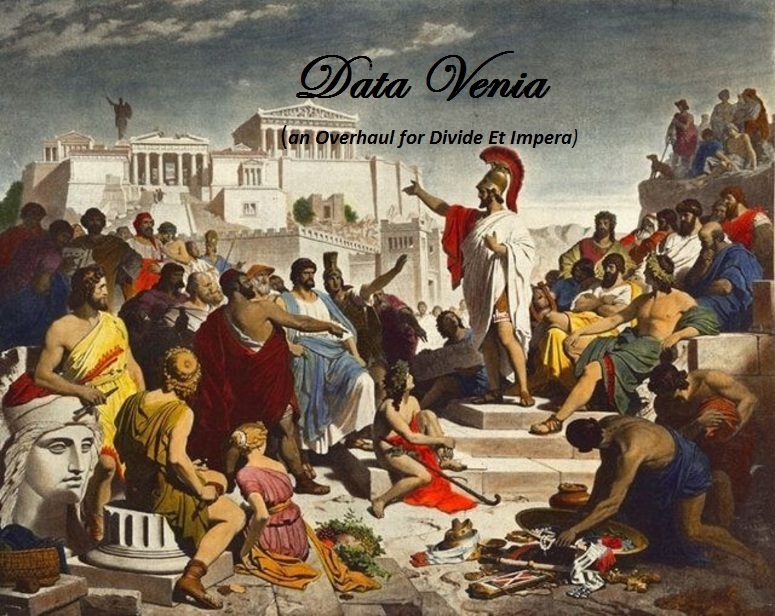 Updated civil war tables in main mod and added a normal civil wars option in downloads (load before Data Venia). Updated to correct hidden income/gdp values for all packs (1/3 less than default DeI value). Deactivated political occurences, should be no more blackmail, assassination or adoption-spam! (Hopefully - tested 40 turns and nothing. Normal civil war submod in "downloads" still has default DeI politics active for those who prefer this type of gameplay). Slightly increased agent recruitment costs. Edited slum-values (2 turns to appear, 1200 cost to demolish). Reverted back to old hidden income values after some testing (was not feasible to decrease income for several factions). Tweaked bows/slings, larger difference between the different types in terms of spread/damage (between basic sling1, medium sling2 and elite sling3 - same for bows). Tweaked AoR ranged units a little to go along with the new bow/sling tweaks above (example: AoR slingers reload a little bit faster than default basic slingers). Edited version of "Legendary Commanders" now integrated into the mod with permission! Added buffed shield-block values against ranged attacks (mainly for good shields). Slightly buffed weapon damage for pikes in formation. 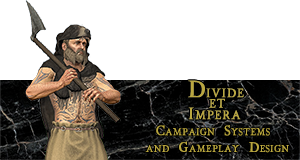 Slightly lowered spread for bows/slings, moderately lowered spread for javelins/pilum/precursors, added marksmanship bonus for javelins/pilums/precursors. Slightly buffed indian elephants hp/armour. Slightly nerfed scythed chariot armour. Buffed wardog run speed, acceleration and charge speed. Added FlashHeart07's diplomacy fix. No more getting tens of thousands of gold from AI via diplomacy (example: previously you could ask the AI to give you 6000 for trade, 8000 for peace etc), max values you can ask for have been lowered. Should increase the difficulty of managing economy a bit for the player. Removed shield values from Lusitani Ambushers (because they don't have one!). Buffed Saka Foot Archers (they were too weak for the price, better accuracy/damage now). Corrected wrong ammo value (too low) for Italian Garrison Slingers. Slightly lowered attack/defense/charge bonus values from veterancy (you could reach very high values). Slightly increased fatigue from prolonged melee combat. Cleaned up unit tables (more ammo corrections, shield corrections etc - hopefully no more skirmishers who run out of ammo after one throw). Fixed political events still appearing in CiG only. Increased Light Spearmen size (for celts/gauls) to 300. Decreased Edetani Nobles size to 200. Slight adjustment to slinger damage. Slightly higher experience required for generals/admirals/agents to level up (army traditions values are left as is). Buffed flat regional supply values by 1.5x to compensate for more armies (also tested and works well with 41 army unit sizes). AI should now be less inclined to offer peace. Persian factions can now confederate into the "Persian Empire" (except Cappadocia and Ardhan). All greek factions can now confederate into the "Hellenic League" (including Epirus, but excluding all other Successor-states). Non-military buildings and objects should now be weaker and catch fire/be destroyed easier in battles. Pikemen now move a lot slower while in formation - if you want to run disable it temporarily! Slightly reduced all bonuses from veterancy except morale-gain. Garrison mob/townsfolk increased to 400 per group (MOB!). Dog groups increased to 150 men/148 dogs. Barf barf. Reduced recruitment prices slightly for several AoR levy infantry-types. Falx weapon bonus against infantry/cavalry slightly increased. Lithobolos ammo slightly increased (after doing tests firing on walls). Lithobolos ships build price dramatically increased (part of ship price overhaul, WIP). Lots of general stat tweaks to armour, shieldblock, accuracy, attack/defence etcetera. Increased spike trap amount from 2 to 8 in town defence (they were useless with increased unit sizes previously, now they can do moderate damage to 1-2 groups). Added Massalia/Cimmeria to hellenic confederation list. Disabled Takashila being able to confederate with persian factions. Small stat corrections to various units. Last edited by Ygraine; April 10, 2019 at 04:41 PM. Looks great! Downloading now, thanks. Nice stuff Ygraine Great option for those so inclined to this type of campaign/battle experience! If anyone has any questions or thoughts feel free to post them. I already uploaded 12 TPY on request today and I might make more versions if someone wants a different TPY-pace. Excellent work; Me too I don't like like some changes in DeI 1.1 (especially bulk removing units abilities). But don't fall into same error as DeI team to disable everything it is thinking don't work...That removes a lot of taste from the game; thus removing civil wars is a mistake. I know this don't run properly but many peoples like this option as it is. Me too. Last edited by Ygraine; November 02, 2016 at 04:18 AM. Political events should now be deactivated, ie assassinations, blackmail and adoptions (hopefully, tested for 40 turns roughly and didn't have a single popup). Yippie! The normal civil war version still has them active for obvious reasons for those who prefer both systems intact! Currently testing larger army-sizes with edited supply region scripts (increased base supply values in all regions to be able to handle the larger armies, otherwise you'll get instant starvation) and if working well I will release an optional version suited for this for people who prefer giant battles and have a computer being able to handle it. Last edited by Ygraine; November 02, 2016 at 11:36 AM. This makes me angry because now we have less to bicker about! no, but seriously, good to see you put out your own submod. Good job. Both alternate non-steam links appear to be dead. Apologies, either I'm stupid or this forums hyperlinking is weird. It wasn't working because the forum apparently assigned extra "https://" to the links, even though I removed one extra when uploading. Last edited by Ygraine; November 03, 2016 at 10:19 AM. I got permission from the author of "Legendary Commanders" ( http://steamcommunity.com/sharedfile.../?id=658590650 ) to include that awesome mod into Data Venia so I will begin implementing the new skill-trees into the main mod soon! I've been playing with an edited version of this mod the past few months and it basically adds several new skill-trees to generals (one admiral specific for ships), one "ultimate" skill once you reach level 7-8 and new battle-abilities you can use. It won't be replacing any default skill-trees, just adding additional ones. I might possibly tweak some of the trees and even add additional ones further down the road. Last edited by Ygraine; November 03, 2016 at 05:06 PM. Looks at it on Steam, looks great! Next up on my to-do-list is to buff missile block chances on shields, mainly on the good ones (hoplon, roman, thureos, aspis, large sparabara wicker shields etc). Needed to balance out versus the buffs ranged weapons got recently. Heavy armoured infantry with large strong shields need to be able to block a bit more missiles frontally. Also remade the to-do-list with colours, hopefully better overview now on what is planned in the near future! Last edited by Ygraine; November 03, 2016 at 10:03 PM. Awesome submod, thank you Ygraine. Spearmen (hoplites mostly) charge looks some overpowered. Unarmored Skrimishers clear to useless. Simple increasing damage not an option. I think we need some "use effect" for javeline like a fire arrows. Like a "armor penalty" or "shield down". Something like THIS (Projectiles mod in steam). Think about it.